Figuring you might be looking for an easy dessert for the holidays, the Accidental Locavore would like to propose this old favorite. 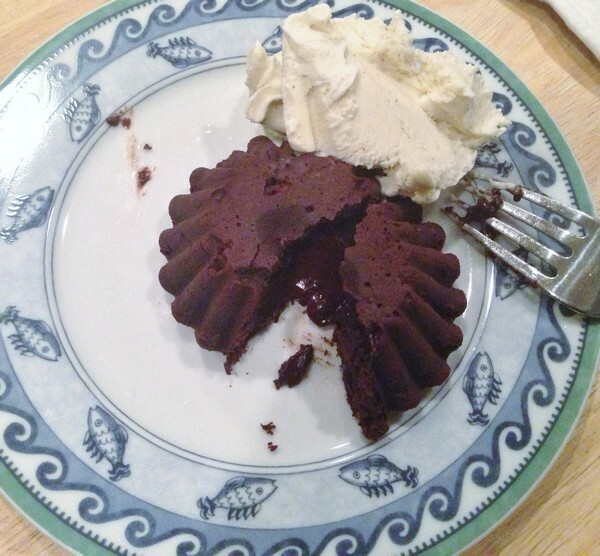 It’s a really easy, incredibly good, molten chocolate cake recipe. I originally saw it done on Martha Stewart years ago, and have been making it ever since to rave reviews. I usually make them before guests come, and keep them in a cool place until ready to bake. Make sure you use the best chocolate you can find. The other secret is to use small metal brioche tins (and if you can find the non-stick ones even better! ), they cook much quicker than ceramic ramekins. Makes 4 individual cakes (but the recipe can easily be doubled). It’s great served with good vanilla ice cream and fresh raspberries. This is adapted from Martha Stewart, and John Georges Vongerichten. Butter and lightly flour four 4-ounce molds, ramekins, or custard cups. Tap out excess flour and set aside. In the top of a double boiler or heat-proof bowl set over a pan of simmering water, combine butter and chocolate; heat until chocolate has melted. In the bowl of an electric mixer fitted with the paddle attachment, beat together eggs, yolks, and sugar until light and thick. Add melted chocolate mixture, and beat to combine. Quickly beat in flour until just combined. Divide batter evenly among the molds. If you’re making these ahead of time, set aside in a cool place until ready to cook (usually right after you’ve cleared the table). Preheat oven to 450 degrees. Place filled molds on a rimmed baking sheet, and bake until the sides have set but the centers remain soft, 6 to 7 minutes. Invert each mold onto a plate, and let rest 10 seconds. Unmold by lifting up one corner of the mold; the cake will fall out onto the plate. Serve immediately and enjoy! fast weight reduction. Make sure you always hawve one written before you do your shopping. offers, your revenue should increase if it. You’ve been fighting your work for some time now. assure its safety and effectivity. It should go without saying but anything that youu usee for soap making should be only for soap making and labeled tyat way. group such as running, swimming, tennis, or even dancing. Accidental Locavore Wonders Why is Everything on Pinterest so Beige?